Englishman's Bay is a secluded beach on the leeward coast of Tobago, between Castara and Parlatuvier. Although the bay does not draw the large numbers of beachgoers that Tobago's western beaches do, it is considered one of the island's most beautiful. 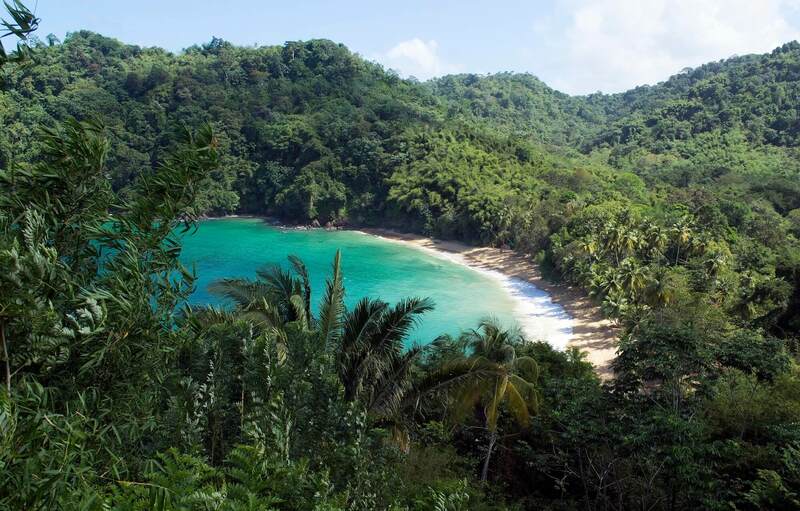 The beach itself is a classic crescent shape, capped by two heavily forested headlands descending from Tobago's Main Ridge. The sand starts immediately after the forest ends and is of a shallow to medium gradient and somewhat coarse grain. The beach itself does not change size drastically at high or low tides, due to the gradient. There is pretty heavy beach break. Due to the amount of waves the beach does not boast magnificent snorkeling. As of 2018, there is one small restaurant/gift shop, Eula's, and a single stall male and female bathroom. You can expect roughly 20 or so people on the beach which makes it safe to leave personal items at your towel. You will easily have space to yourself if you prefer. There's lots of sun as well as shade.